It's only started happening within the last week but now happens everytime. Basically it's not setting markers or TP'ing you to the correct place. This is on MP. Site Suggestions and Bugs / History Page! I must first credit Gordinio for giving me the idea. Basically he wanted to have it so when you entered his factory you could press a button and open the stocklist to see what needs making. What I think could be changed. - Allowing keys to be used as well as X-B-Y as this opens up loads of possibilities. - Making the script run for longer. Because the stocklist is a menu I had to hold the button in for it to stay up. - I can't see any way to clear the SetEventScript using scripts, say when you left a zone. Bug Reports [Retail] / Bluscreen when loading game. Was loading TM from Desktop got a steam error about not being able to find steam files on cloud but never got this before. Game loaded map list and bam, las Bluescreenio. System.InvalidOperationException: A previous Draw call threw an unhandled exception. See InnerException for details. ---> Microsoft.Xna.Framework.Graphics.NoSuitableGraphicsDeviceException: Unable to create the graphics device. ---> Microsoft.Xna.Framework.Graphics.DeviceLostException: Exception of type 'Microsoft.Xna.Framework.Graphics.DeviceLostException' was thrown. I was recording at the time so i can upload the footage if necessary. Questions and Answers / How the devil do I script a Tax System? I want to script a Tax System in my map because money is nice to have. It will give the player a history mark when they buy a property and place them in a tax band (like irl). So if you pay 5-10k for a house, you'd pay 75 tax lol idk. 2) How do I script a system to check if they've paid and add it to their next bill (so it's double). I considered just adding a loop script to joining script but if they left and joined immediately back (lagged out?) they'd be taxed twice. Bug Reports [Retail] / Bluescreen when changing applications. I was changing from xbox app to TMPC on my laptop. Has happened twice. Bug Reports [Retail] / Almost all the map isn't loading. Since this new update came out two things have happened. 2) Literally a 100x100 square of map has loaded. Why isn't my map loading? I've waited 10 Minutes and still a ton of chunks aren't loaded. I've tried reloading the map, the game and my sanity. None worked. Hello Forum Dwellers. Myself and a bunch of cool people from Discord and the forums (circle cat113, cY Agent 115, Gordinio, HydroSimp, RemoteBeef and Resident modder XBL toothpick) have been working on an unofficial Total Miner Community YouTube channel. You are probably all thinking, "Wait, isn't there already a community channel?" and you'd be correct, Monkey has one. Thing is, it's a bit inactive at the moment ( ). An awkward British kid with an interest in building things that already exist. Plans to do a series where he builds an entire city. Still trying to figure out how to script an auction. Overuses puns. The guy that spends hours of his day making huge medieval RPG style maps. The all-rounder that knows a bit of everything but isn't specialist in anything. The host who makes sure your gaming experience is fair! He doesn't talk, he hardly exists. Making some speed builds (soon hopefully) He enjoys a well structured challenge map, and Fallout. He likes to make videos without talking - but with good music. He edits, he smiles, he laughs and he cries. Making a Dig Deep series (when it comes out) He enjoys a good laugh and consistency (especially in thumbnails) He likes to make informative - but silly videos. Here at Dig Deeper, we try to upload at least one high quality TM video a week, and occasionally we stream TM content on our channel. You can expect all types of different videos from tutorials to map builds and tips and tricks. I'll link our first three videos in this post, and the rest I'll post here and in a separate post underneath. We hope you continue to support our channel as we grow! We are going to be doing a weekly podcast with a member of the Total Miner Community. If you'd like to be a part of this, please make sure you meet the following criteria. - You'll also need to be available for at least 60 minutes. (15-30 to set up and make sure everything is working and the rest for the bit the viewers see! - Ideally it will be a stream but can do videos if it's easier, though these may be shorter. - Send us a message on Discord (staff list in OP) or reply here if you're interested. We need a minimum of a days notice. - If you'd like to be involved in other videos, such as skits and news videos (we haven't finalized exactly what yet) then let us know! We are open to all ideas. Ideas / Fill with halfblock..
Not much to say other than can we have the ability to fill with halfblocks? Can someone explain each option on terrain tools please? Eg Noise and stuff. I want mountains with flat tops to build on, like Huttondale. Basically an accurate representation of life in a small part of Yorkshire - a county in England. Yes, I'm being that specific. 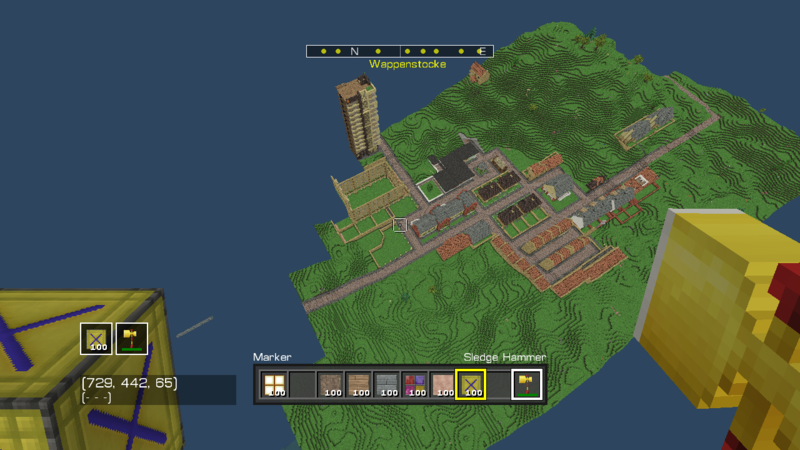 Hello everyone and welcome to my Wappendale map on PC. Weird name right? Let me explain. ~ Wappenstocke: A viking word meaning "Administrative District"
~ Wappendale: A since demolished club in Sheffield, England. Over 100 Pre-built business premises inc. offices, shops and factories. These can be converted from houses or bought pre-built in the shopping centre or in village centres. Over 25 Derelict barns ready for conversion into businesses or properties. These can also be demolished, just like with most properties and businesses. 75% automated with scripts because sometimes things go wrong! Village mines and farms located around the map. Player ranking system, just like before cos if it ain't broke - don't fix it. Five villages and one town located in the centre. It's a grasslands map so views galore! A multitude of ways to make money inc. careers, farming, mining, ranks and rewards. Player points system, again - as before. A bit more about them seems as these are my favourite things to build in maps! I want to make the system a bit fairer than in Huttondale and previous maps, so I've done some radical-ish changes. Not on the ability to buy next door! For the price of the wall + 25% (for labour!) you can convert your average semi-detached house into a MEGAMANSION or just a detached reasonable sized house. At the moment, I'm going with no restrictions on number of properties or businesses but they may change to 5 on each depending on if there's any monopolies going on. All barns will cost under 50,000 Aires. Generally it's half the full sell price if non derelict but can be 75% depending on condition. Still working on percentages for shops but will cost no more than 100,000 for a premises and block and item shops will be 10,000 Aires plus rank costs. Emley Hill: A take on Emley Moor, home to a ABSOLUTELY HUGE tv mast called Emley Moor Transmitter. The TM version will have an observation tower. Owl Valley Shopping Centre: Home to JG, Omega and loads of player owned shops. It's going to be an almost exact replica of Fox Valley in Stocksbridge, UK. Located in a valley, just like the real one. Shelley: The village in Yorkshire i want to live in. Stainton: Name is taken from a village near to where I'm from. Thorton Dale: Based on one of Yorkshire's quantiest villages - Thornton le dale. Wappenstocke: I'm sure this is an old english word but 'Wappen' means 'coat of arms' in German. Anyway, this is the main town, set around a medieval market cross. It'll have all the usual facilities, such as shops, banks and a health centre. It'll be perched high up on a hill somewhere. I'm going to try and record 5 to 10 minute long videos for the Dig Deeper Community YouTube Channel showing updates, which i'll probably link here weekly instead of rambly post telling you that i added dacite to a mine. That's all for now. Please leave suggestions here or ping me on the Total Miner Discord. See you soon! Total Miner Discussion / [Game] Six Years of Total Miner! I have a lovely job script on my map but the script that sells the items you make and teleports you out of the factory is broken. Completely broken. So, here's a brief description of how jobs work. 1) You get a job 2) You get materials to make selected products 3) You enter code to get in factory 4) You make the items (workbenches etc.) 5) You press a button to leave factory area and it sell what you've made. You get more if there's less than 10 of an item. 6) You collect a paycheck. The issue lies with 5). You see, it adds the stock you've made to a stocklist so that those items can be bought at a shop. Supply and demand in a way. What's been happening is it's selling 10,000 workbenches even if you have only 100 etc. but the workbench script lines are same as the other products so what's wrong? The script is long a repetitive as it sells multiple products but here's an extract. That should be right. The "History [Job\JG\Earnt] [+187]" lines are so I can check how much people have earnt for research purposes. If you can see anything wrong with the script then let me know. My connection is famously bad so it may be that. I really don't want to start a new map because of this issue. Howdy, as requested by ShiFt Shandy, here is how I do my property scripts. Now I add a lot of pointless history markers in my property scripts so for this guide i'll exclude them. As usual, i'll have optional parts in green. Let me know if you have any issues or any suggestions. If you want to be sure to share your property scripts as a response. Also, would you like to see these in one topic, rather than linking them below? Thanks for reading and let me know if you'd like to see more!